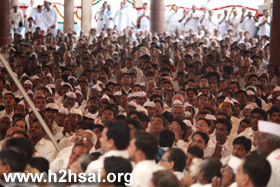 The second day of celebrations leading up to Ashadi Ekadasi dawned on July 2, 2009. It was a wonderful morning and at the centre of the Sai Kulwant Hall stood a huge stage. The stage covered the entire stretch of the central part of the Hall horizontally. Eight big focus lights and many huge speakers were part of the stage set up that Swami had enquired about the previous day. One subtle lesson was to be noted here. Swami had expressed His uneasiness about the huge scaffolding and the stage, and also pointed out how the big set up was touching the lights on the top of the Hall. But it was submitted to Him that the stage looked grand. There are times when Swami hints at something. We must always pray that we have the alertness to recognise it and the wisdom to execute it as He wants. Someone once said that God gives direct advice and commands only to those who He is sure will obey Him to the word, for the sin of disobeying the Divine is too big for anyone to bear. Out of His mercy, He gives us subtle signals so that in case we do not obey, we do not bear the burden of the sin of direct disobedience! Swami did not seem too happy about the structure that still stood in the centre. 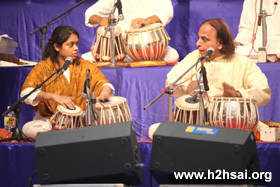 The scheduled programme in the evening was by Taalyogi Pandit Suresh Talwalkar - one of the greatest Tabla exponents of the present times, synonymous for his untiring efforts, devotion, and endless passion in pursuit of promoting Indian classical music. 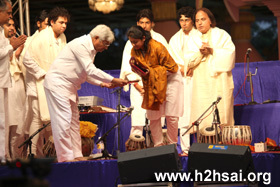 Pandit Sureshji belongs to the illustrious “Keertankar” family of Sri Dholebuva. Swami took an entire darshan round. It was a beautiful sight to watch as Swami moved into the gents’ side. The traditional Maharashtrian attire demands a typical topee or cap for completion. Hundreds of white caps seemed to rise from the crowds as the people rose in salutation to their sweet Lord. 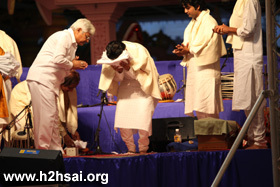 Swami completed the darshan round by going through the portico and then arrived on stage after 5:15 p.m. Listening to the Veda chants for a while, Swami asked for the programme to begin. 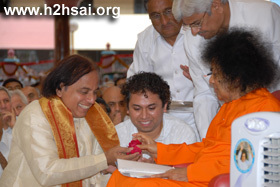 Pandit Sureshji made a floral offering to Swami and "introduced" to Him, his son Satyajit and daughter Savani. 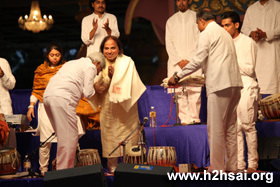 Swami blessed them and all the other accompanying artists as they wended their way to the erected big stage. The Pandit began by saying that it was more than three decades ago, in 1973, that he was blessed to perform in the Divine Presence. 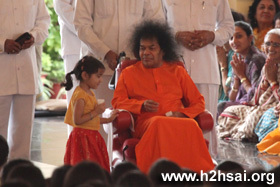 Since then, so many things have changed but as always, the love and connection between Swami and His devotees remain! On that day he was happy to be playing again for Him. For him, it was a ‘seva’, a service. 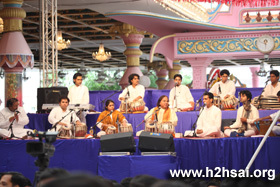 The stage had five tablists, one person each on the mridangam, harmonium, keyboard, cymbals and the sarangi. 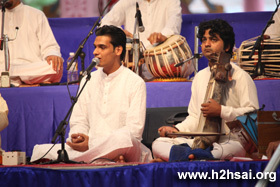 There was also a vocalist who would accompany the Pandit at many junctures during their performance. It was a musical feast for the next forty minutes or so as the troupe weaved sheer percussion magic. The songs “Ananda Lahari Bhajave …” and “Dheem, Dheem Dama Damaru Baaje …” by the two vocalists and the taals (vocal beats) by the Panditji kept the appreciative audience riveted to their places with intermittent applause. 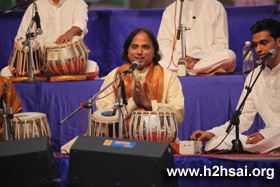 There were also interludes in the form of performances by the flautist, one each on the tabla, Sarangi, harmonium and the keyboard that added variety to the performance. The whole concept was designed in an innovative way as the Panditji was well known for it, to make it an apt offering to the Ganapriya, the lover of music, that Swami is. Swami that day seemed to be in the Gambhirya Bhaavam, He seemed so Divine as He sat totally unaffected by anything that was going around. Not an emotion arrived on His serene face. He neither looked serious nor jovial. His eyes were fixed on the stage for most part of the programme and at other times He was lost to the world as He closed His eyes. It seemed like a demonstration of perfect Sthithaprajna. The crowd burst into applause many times, but nothing seemed to stir in Him. Seeing Him itself inspired one to attain that state of unaffectedness - the state of tranquility. That was how He was throughout the programme. At the end of the performance, Swami asked the State President, Sri Sathya Sai Seva Organisations, Maharashtra and Goa to honour the artists with shawls and white safari suit pieces. The maestro's daughter was presented with a saree. 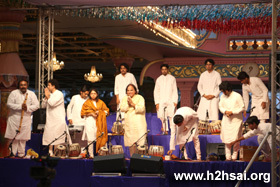 The artists got up to come forward but Swami told them to be seated on the stage itself. As they were honoured there, the crowd burst into appreciative applause. 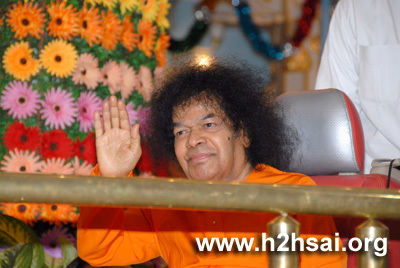 Swami asked for the aarthi to be performed and blessed sweets to be distributed as prasadam. When one of the members of the youth came forward and presented a rose to Him, He told him, "You were thin but have become fat now! Reduce a bit!" The person accepted Swami's advice with a smile. The State President confided into Swami that the artists desired a photograph with Him. A smile came over the Divine face and He asked them to come down. He personally arranged them saying to the Panditji, "You be in the centre!" Swami then moved down and posed with them for pictures which the artists would surely treasure for a lifetime. All of them fell at His feet and sought blessings. It was nearly 7:00 p.m. when Swami moved into His residence.